Express your love with this stunning aqua and diamond ring. Crafted from bright 18ct white gold, this beautiful ring features vivid aqua stones shouldered by delicate diamonds. 18ct White Gold Aqua & 1/10ct Diamond Solitaire Ring is rated 4.5 out of 5 by 2. Rated 4 out of 5 by Anonymous from Beautiful but not as expected This is a beautiful and very subtle ring. It is well made and suitable for wear everyday. 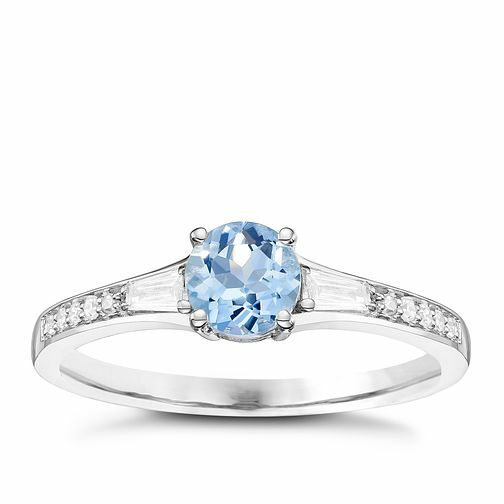 My only negative comment is that the website image of the aquamarine is very misleading. The stone in my ring is a washed out blue and to be honest is so pale, it looks more like a diamond. It is nothing like the blue in the online image, which is why I've only given it four stars. However this doesn't mean that I like the ring any less. I love the ring and the colour difference of the stone makes no difference to me, but it was not what I had been led to expect. Some customers may be disappointed. Rated 5 out of 5 by Anonymous from Stunning Looks amazing and elegant. Perfect for those ladies that have a soft spot for a bit of subtle colour. Massive man City fan hence my choosing of this. She said yes.... In case you were wondering.